Almost a year has passed since the last release of the Wacom Tablet KCM. A lot has happened on my side but I finally found the time to to some hacking on the code again. This beta tackles a few issues from the bug tracker. Now you can connect as many tablets as you want and select between them in the KCM. For each tablet the correct profile will be applied, while the global shortcuts will be used on all connected tablets. New global shortcuts allow you to rotate through a list of profiles (for each individual device). You can map this onto the tablet (for example the button 1 on the Intuos) to do a fast profile switch. In addition the LEDs should tell you which profile in the rotation list is currently active. In case new tablets are sold which are not in our own tablet database yet, you can go through the process of detecting and specifying them with the help of this application. The result will be saved in a local database that will be checked first when the tablet is connected. This way you can also override the existing tablet database with your own changes. You can find the source archive on kde-apps.org or in the releng2.1 branch. A few month have past, this my last WebMiner update. In the meantime I finished my Master Thesis, moved to a new location and started my new job. Perfect time to release a new version with the changes I have made since. User changeable regular expression for the filename parsing. Removed its own and reuse the Nepomuk internal fileindexing to get id3 tags and other file metadata. Add whitelist for automatic web search. You might like to lookup the folder with your publication pdfs but not your private documents. Or the network share with your tvshows, but not your private family videos. This works on top of the Nepomuk whitelist. 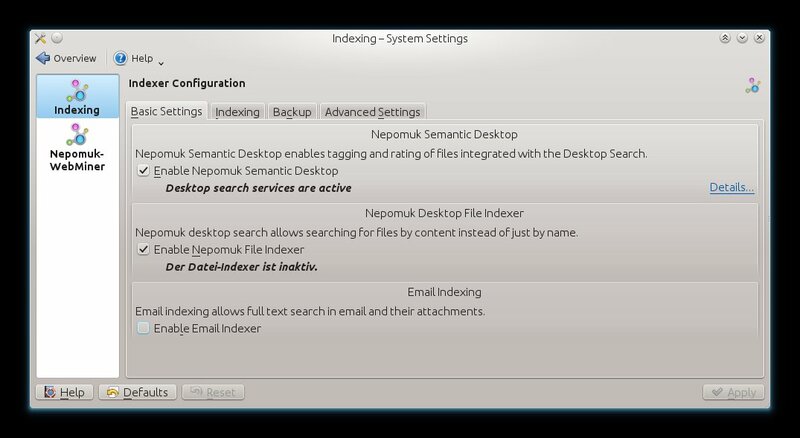 So you Nepomuk can index these files, but not all of them will be websearched. 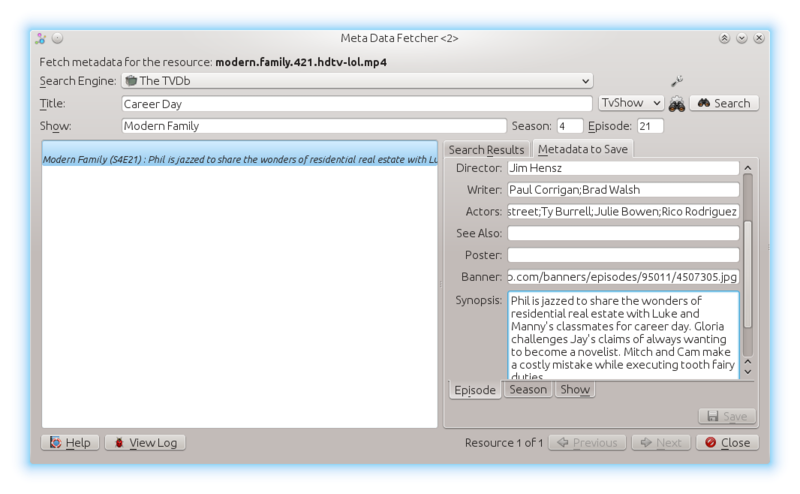 Instead of the dull treeview that shows the raw fetched metadata, you can now see and edit the metadata in several fancy edit fields. You can find the latest release on projects.kde.org or the tarball on kde-apps.org. Even though I wanted to get this into KDE SC 4.11, I doubt this is going to happen. Soft feature freeze is around the corner and I don't feel comfortable enough to let this be part of SC and annoy all users with this service yet. 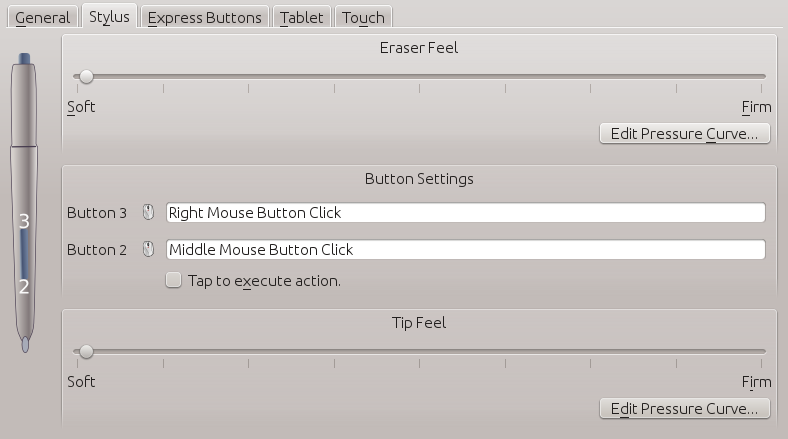 There are still a lot of usability problems I like to have solved properly before this can be part of of any KDE installation. So please test the latest release and report any errors back to me. We are proud to announce the final 2.0 release for the KDE Wacom Tablet KCM. A lot has changed since the last proper 1.3.8 release. Most noticeable to the user are the new and better multi-monitor handling and the enhanced expressbutton features. * Fixed bug which would prevent the default profile from being created properly. * Fixed bug which made it impossible to use some special keys as express button shortcut. * Fixed bug where the plasma applet would not rotate the stylus controls. * Fixed bug which displayed the tablet in an inverted rotation if auto-rotate was selected. * Fixed bug which prevented the screen mappings from being applied correctly when the tablet was rotated. * Fixed bug which would not allow to set a screen mapping on the touch device. * Fixed bug where invalid area mappings would make the stylus stick in the upper left corner. * Changed way how tablets are reset to their full tablet mapping to fix problems with Intuos 5 tablets. * Added some more tablets to the tablet database. * Updated button hardware mappings for the Intuos 5 Touch. * Disabled Waltop devices in the database as they are in conflict with some Wacom devices. * Improved button shortcut handling. * Improved handling of auto-rotation. * Tablet areas can now be selected for each screen independently. * All screen mapping can now be handled with one dialog. * Global shortcut to switch between Fullscreen and a single Monitor. * Tablet and touch area selection now takes the rotation settings into account. * Added feature which allows the user to invert the scroll direction of the touch device. * Many bugfixes in the background. 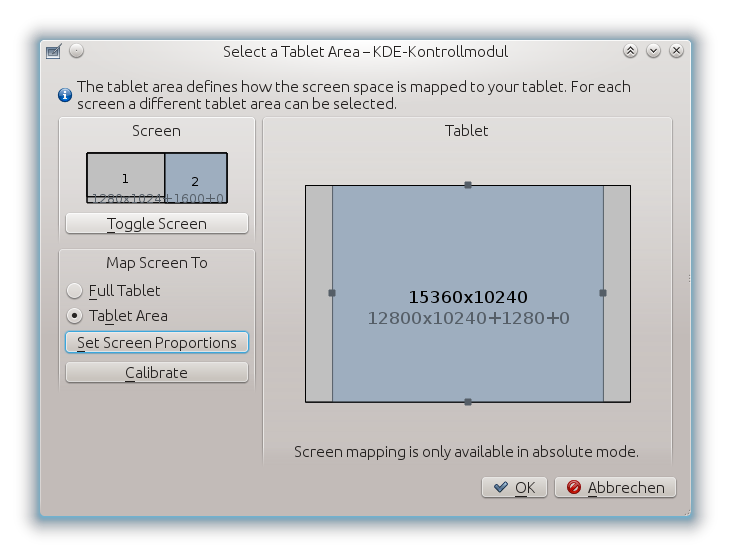 Today I like to announce the new and last beta for the KDE wacomtablet tool. The 2.0 beta 7 release contains many new changes, since the last stable (1.3) most of the code has been changed and many new features are finally working. Tablet areas can now be selected for each screen independently. 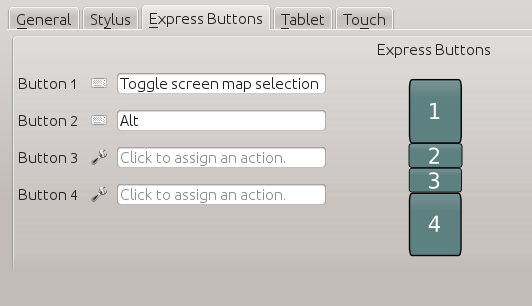 All screen mapping can now be handled with one dialog. Global shortcut to switch between Fullscreen and a single Monitor. Tablet and touch area selection now takes the rotation settings into account. Added feature which allows the user to invert the scroll direction of the touch device. Many bugfixes in the background. The screenshots below show you how the KCM looks now. Changed dialog to select the button actions. From now on only bugfixes and translations will be added to this release. So please test it and report any error you might find. Since my last post a lot has happened to the Nepomuk-WebMiner (former MetaDataExtractor). 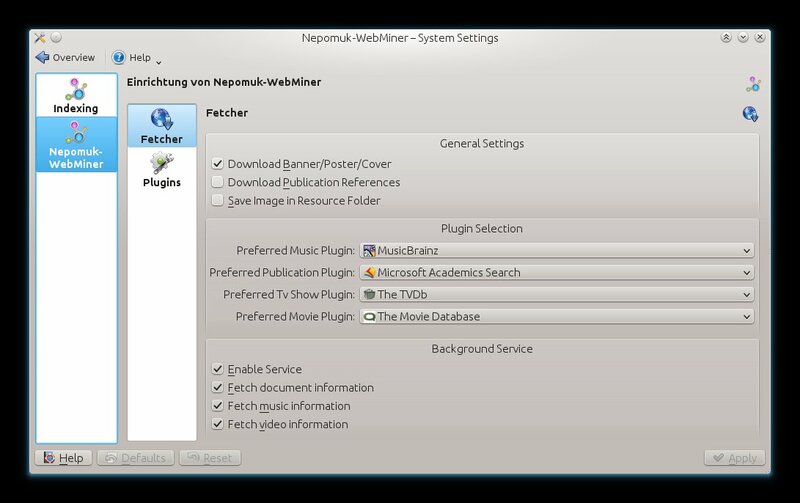 The WebMiner went through the KDE Review process and got cleaned up a bit during this process. The new location of it is extragear/base/nepomuk-webminer. On the code side, I have fixed several bugs and integrated the automatic fetching better into the current Nepomuk system. The new WebMiner-Service respects the suspend/resume and event monitoring (no internet, low diskspace, on battery mode) in the same was the FileIndexer does it. When the automatic fetching is started via the command-line or dolphin command, the service is used for the actual fetching. This allows to show the current fetching progress in the nepomukcontroller (in the systray). 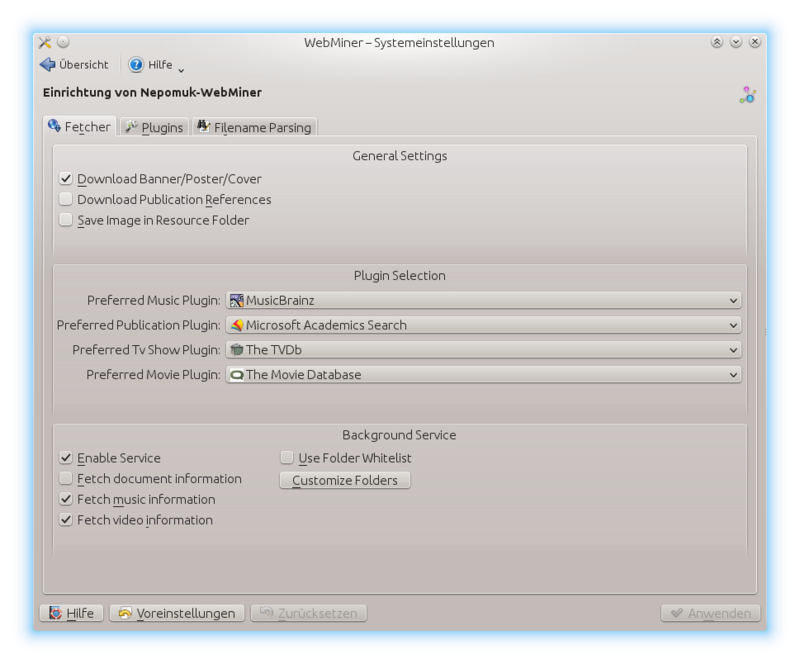 Starting with KDE 4.11 the Systemsettings for Nepomuk and the Nepomuk WebMiner are combined and won't show up as two different entries anymore. Instead of the buggy imdb python script that has a hard time following the changes on the imdb website to allow proper fetching of movie resources, a new plugin for themoviedb.org was created. 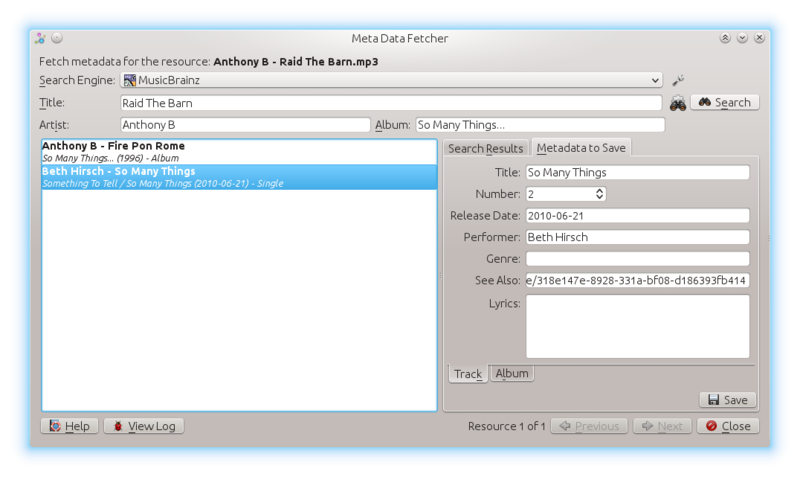 The next step for the WebMiner will be the full integration into KDE SC for the 4.11 release. So moving out of extragear again into some other proper place. In order to make this happen there is still one large blocker task that needs to be done. So if anyone is good with python and has some time, the script at nepomuk-core/services/storage/rcgen/nepomuk-simpleresource-rcgen.py needs to be improved. This script is responsible to generate the SimpleResource classes from the used ontology. As it takes nearly all ontologies into account and is rather slow right now, the call takes ~20 minutes for each generation. This is a pain for anyone compiling the WebMiner from source. In its current state the extractor respects the users privacy as much as possible and can still be configured to do all its magic in the background. 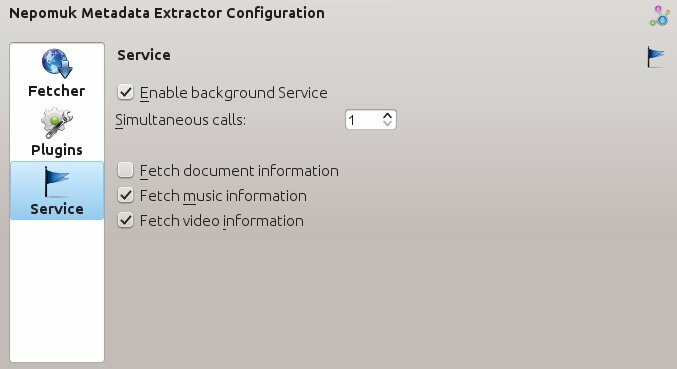 Beside the service changes it is always possible to start the extractor from the Dolphin service menu manually. Another thing that will change is the name of the program. When I've started this project (mostly as a helper for conquirere) there was already a project named Nepomuk WebExtractor in playground. As it seems this project is dead, the name will be available again. 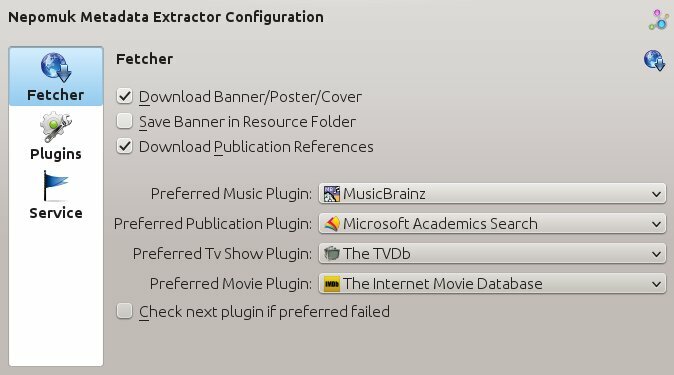 The name MetaData Extractor might be misleading too. 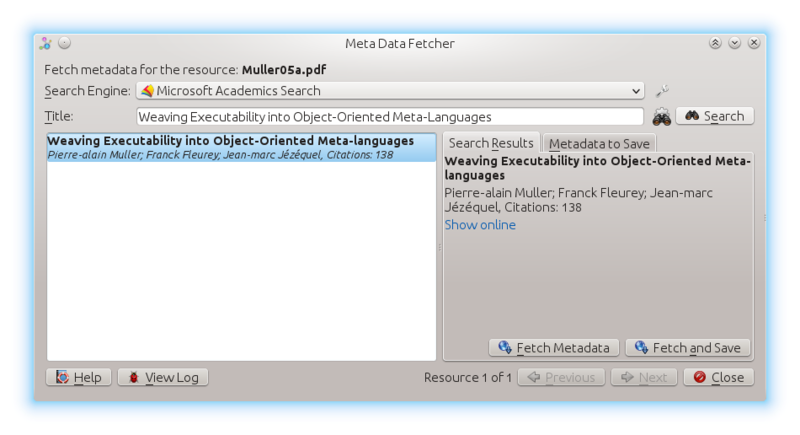 This program does not extract information from files (other than filename analysing for better search parameters) but only rather find additional data on the Internet. I'm posting this on behalf of Alexander Maret-Huskinson who did most of the work in the latest release. It's been a while since the last update, but today we released two new versions of KCM Wacom Tablet. Version 1.3.7 which is another update of the stable 1.3 release and 2.0-beta1 (1.99.2) which is the first testing version of the upcoming 2.0 release. The 1.3.7 update does not contain any new features but adds support for some additional tablets and fixes a bug where the tablet was rotated in the wrong direction when auto-rotation was enabled. Unfortunately the beta version does not contain any new features either, but still a lot of work has been put into this upcoming 2.0 release. 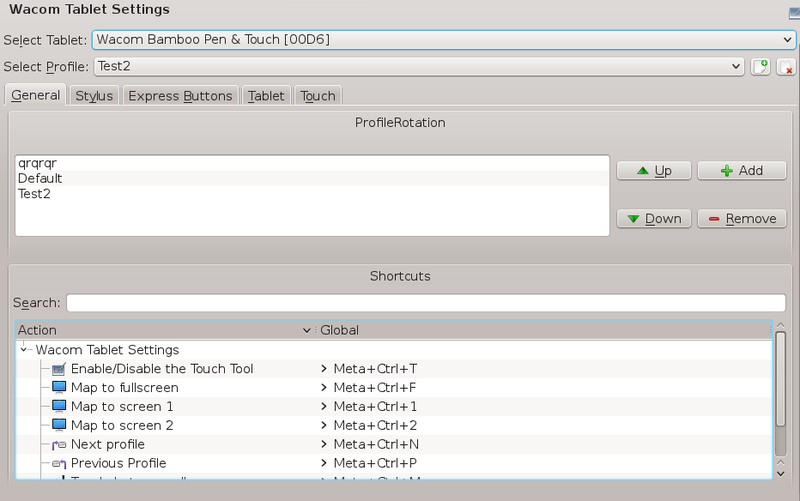 We rewrote the whole backend to make it more manageable and prepared it for the long awaited libwacom support. With the new architecture we can now easily support different subsystems which allows us not only to support libwacom but also any other configuration tool like for example the Intuos 4 Led project. Support for these projects is not yet included but will be added in one of the next releases. Although we put much effort in testing, there are probably still some bugs left which we did not catch. We also have only a very limited number of tablets available, which is why we ask everyone to thoroughly test this beta and report any bugs we missed.